In theory, carousels on a website seem like a great idea. They give us the ability to put a variety of information within the same section of a webpage. Since a website’s homepage gets more traffic than any other page, you would think that a carousel at the top of that page would get the best visibility. Carousels also hold several slides, which make them sound even more appealing for cramming in as much information as possible. However, in practice, carousels don’t work. Think about it: when was the last time you saw a carousel on a website? Do you remember waiting to see every slide? Or did you acknowledge the carousel’s existence and then carry on with browsing through the website without clicking on anything carousel-related? Why do we ignore carousels? They feel like advertisements. I don’t know about you, but I automatically ignore most web ads. How about animated ads? I am even more likely to ignore those. Since carousels typically have motion, they feel a lot more like ads to users than valuable content. Often, they serve as a way to showcase a website’s internal products, essentially making each slide an ad. You can’t skim the content. The trend in web design is to let your content breathe—to spread it out on a page and embrace scrolling. Users are used to scrolling, and it allows them to quickly skim content to find the information they need. When you constrain content in a carousel, users can’t scroll to digest all the content at once or at their own pace. Instead, they need to either wait for the animated slides to move at whatever rate they were programmed to move, or manually click through each slide. You can’t finish reading it either. If users are trying to engage with the carousel and read the content, chances are it will move to the next slide before they’ve finished exploring the content on the current slide. That’s distracting, and it makes the user experience clunky if people have to shuffle through the controls to find what they need. Also, users typically only see the first slide of information before ignoring the carousel and browsing to a different page. So why bother including all the additional slides? Carousels are usually used as a catchall solution for promoting several pieces of content on one page. It’s also convenient to keep using the same slides for a while, which quickly makes the information stale and easy to ignore. In place of a carousel, you can use featured content that is constantly updated. Create separate static pages. Instead of making separate slides for different pieces of information, focus on creating separate pages that you can link to in email or social media campaigns. Separate pages are more searchable, and search engines can easily index the content, making it easier for new visitors to discover it and see what they may have otherwise ignored in an animated carousel. 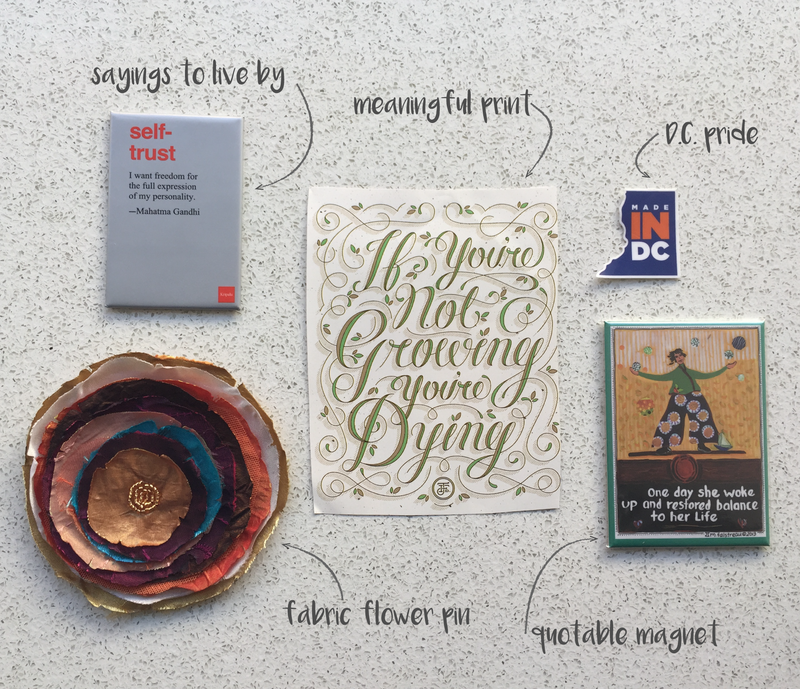 USGBC Studio: What’s on your desk? For someone who pretty much lives on social media, thinking 10 steps into the future, it can take some work to create environments where I can get grounded and focused on the present. Like most Leos, I take serious pride in my den—workspace included! Meaningful prints: I am always on the lookout for striking prints. Sometimes they come right out of a magazine I picked up on my way home. They make amazingly easy, colorful, inspirational additions to my work and home spaces. Sayings to live by: I am a writer by trade. I’ve taken a lot of funky routes since I graduated with that degree in hand, but I am constantly finding ways to express myself creatively through writing. Content creation is still the crux of what I do—even when I’m cramming it into 140 characters or less! DC pride: I’ve got lots of bits of past-lives pride at my desk. “Home” is Washington, D.C., at the moment—a place packed with cultural diversity where I have found many parts of myself. It’s no Philadelphia (hometown glory), but this city will always have a special place in my heart. This little sticker is also a big reminder to buy and vend locally. It comes from Compass Coffee in the Shaw neighborhood of D.C. The local roasters serve up a life-changing cup of iced coffee! Pin art: “Have nothing in your house that you do not know to be useful or believe to be beautiful,” said William Morris. This handcrafted flower fills some of my “just decor” quota. Clever and quotable magnets: I have been collecting magnets for a long time. Many of them remind me to make mindfulness a natural part of my day. It’s especially necessary for the workplace—focusing my thoughts on how I communicate, approach my work and positively contribute to this purposeful, mission-driven team. Are there things you keep on your desk to help make your workflow successful? Tell us about them! Check out our other #WOYD posts! USGBC Studio: Super Bowl 50 on social: A winning lineup! What could USGBC and the Super Bowl possibly have in common? This year, everything! Although the green building community and the sports industry may not be the most immediately obvious groups to jump on the same hashtag, jump they did, and it showed that sustainability goes with any aspect of life and culture. LEED was all the talk this year, as the Broncos and Panthers took to the football field in the 2014-certified LEED Gold Levi’s® Stadium, the first of its kind. And that’s not all…the Super Bowl 50 Host Committee brought quite a few sustainability firsts to this year’s big game at the arena the San Francisco 49ers call home. Social media provided people with an awesome platform to incorporate a climate change discussion into one of the most active national Twitter discussion of the year. Some wore orange, some paraded blue, but LEED brought the green. Sunday marks our #SuperBowl debut as the first LEED Gold #NFL stadium. In addition, #SB50 featured a solar-powered stage graced by those needing no introduction…ahem…Bey! All in all, Super Bowl 50 was a win for the Green Team. As someone who has worked on a number of websites over the years, I’ve run into the same problem everywhere—the request to add any important information to the homepage. However, the notion that every piece of major content needs to be added to the homepage isn’t the greatest. Why? There’s too much text. If your solution for every request to highlight content is to place it on the homepage, you will be left with far too much information. Too much text means your users won’t know which information to focus on, and as a result, they will likely ignore most of it. You need timely content. Use the homepage as a place to host timely content that constantly changes. That way, your users have a reason to keep returning to that page. If you’re only displaying static content there, chances are it will rarely get updated. Thus, your users will begin to ignore that page altogether. They will simply access the homepage so they can navigate elsewhere. So how will users see any of the important content? If adding it to the homepage is a bad idea, what should you do instead? Target users with direct marketing. You can reach users who need to access specific information by creating tailored pages that are easy to find when conducting searches on external search engines, as well as your site’s search field. Also, using direct marketing to send out targeted emails with links will ensure that the right users are seeing the information they need to find. Use strategy with the way you craft and market information. Otherwise, it is all too easy for text to get lost in the web. The phrase “build it and they will come” is not relevant when there is so much that has already been built. Think along the lines of “build it for a specific audience, and then target that audience directly.” Then that targeted audience will come, and they will be more engaged with your content than someone who has accidentally stumbled onto the page. In the wake of the #Top10LEED campaign this week, I thought it would be a great time to reflect upon what goes into creating a great campaign on social media. True, it is a lot of work, but though that may feel daunting, it can all come together quite swimmingly if you keep these tips in mind. Staying well prepped and organized is your best bet for launching a project without a hitch. That, and finding the comfiest position at the computer—you’ll be there for a while, ready and waiting for whatever the Twitter board may throw at you! Pick a #: Keep your hashtag unique but relevant, and avoid too many characters. Incorporate graphics, infographics or multimedia: These will absolutely increase the shareability and virality of the content sent out into the social sphere. Connect with influencers in advance who can help leverage messaging: Create one-pagers with all messaging someone would need to promote your content. It should be as simple for them as a copy-and-paste job. Members, stakeholders, government, journalists—whomever it may be—make it seamless for them to participate and make your content so strong they want to participate. Create some buildup: Send teasers across channels to build up excitement. Remind people of the launch date and include just enough information, without giving too much away. Track that hashtag constantly: Notice every ebb and flow. If you have a data tracking system, note what content performs best, what time of day people are most engaged, on what platforms people are talking about it and especially, who is doing the talking. Mix up messaging: Keep things interesting and change it up throughout the campaign. Pace yourself: Don’t invest all of your promotion in day one. Organize the content in a way that keeps it timely, different and interesting even on day five. Stay alert and connect your message to other trending items: Sometimes a topic will begin socially trending that happens to relate well to your own campaign messaging. Jump on the opportunity to bring your discussion into a larger, popular and relevant conversation. Dig deep to find most the important successes. Performance can measure many things. Maybe your campaign increased channel follower counts exponentially. Maybe engagement rates were off the charts. Or perhaps your pre-release outreach to influencers did wonders for the hashtag in the long run. Find ways to highlight what scored well. Assess areas that could use improvement. Of course, there are always tweaks that can be made and areas to be improved upon. It could be as simple as communication among the team members or as big as “We need a whole new strategy.” But hopefully, if you’ve taken these points into consideration—not a chance! Good luck! See you on the campaign trail.